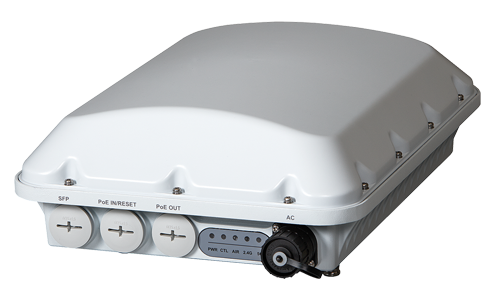 The ZoneFlex T710 combines Ruckus patented technologies and best-in-class industrial grade design with next generation of 802.11ac features to deliver industry-leading Wi-Fi performance, reliability and coverage for challenging high density outdoor deployments. Featuring BeamFlex+ adaptive antenna technology, the ZoneFlex T710 offers a substantial increase in performance and range by optimizing antenna coverage on a per client, per transmission basis. BeamFlex+ additionally mitigates co-channel interference by directing Wi-Fi signals where they are needed instead of towards neighboring access points. The T710’s BeamFlex+ adaptive antenna system is also equipped with dual polarization antennas, allowing the access point to adapt to the physical orientation of client devices and maximize uplink performance. With throughput capacities of 800 Mbps (2.4GHz) and 1733 Mbps (5GHz), the ZoneFlex T710 supports the highest available throughput for Wi-Fi clients. 802.11ac Multi-User MIMO (MU-MIMO) support allows the T710 to simultaneously transmit to multiple MU-MIMO capable devices, drastically improving airtime efficiency, overall throughput, and availability. The T710 is compatible with a wide array of MU-MIMO, SU-MIMO and legacy Wi-Fi clients. The ZoneFlex T710 can function either as a standalone AP or as part of centrally managed Wireless LAN. The ZoneFlex T710 is specifically designed with industrial-grade features such as GPS and secure image download. Also included is a SFP fiber interface that enables seamless connectivity to a fiber backhaul with no additional converters. Via Ethernet connections, the T710 supports Link Aggregation Control Protocol (LACP) to optimize backhaul throughput. The ZoneFlex T710 is purpose-built to deliver unparalleled performance, capacity and coverage in dynamic outdoor environments that are characteristic of high density utilization and interference. Ideal use cases include: public outdoor hotspots, smart cities, outdoor coverage for enterprise and schools where support for data intensive streaming multimedia applications like HD IP video is imperative. The ZoneFlex T710 integrates patented software-controlled adaptive antennas that delivers additional signal gain per radio chain. As BeamFlex+ adapts to client locations and antenna polarity, the smart antenna technology optimizes the RF energy toward client on a per packet basis. This allows for substantial performance improvement and a reduction in packet loss from the ability to automatically mitigate interference and obstacles. BeamFlex+ with PD-MRC (polarization diversity) ensures the T710 listens in all polarizations simultaneously. This results in significant receive signal gain from mobile devices with weak transmitters. 802.11ac MU-MIMO allows the ZoneFlex T710 to transmit multiple spatial streams to multiple client devices simultaneously, increasing the total throughput and capacity of the wireless network. The ZoneFlex T710 is able to provide up to three clients each their own dedicated full-bandwidth channel using an MU-MIMO technique known as spatial reuse. This capability enables several benefits. Efficient use of available spectrum effectively multiplies the total capacity of a network, allowing it to meet the increasing data demand driven by the proliferation of mobile Wi-Fi clients and data-hungry applications and uses such as high-definition video streaming. Additionally, MU-MIMO does not require client devices to time-share connections with other clients on the network as in legacy Wi-Fi, which means each device experiences less wait time and makes the network more responsive overall. Even legacy clients benefit from MU-MIMO because of the increased RF efficiency; more capacity remains to support non-Wave 2 clients. When used with the Ruckus Smart WLAN management systems, the ZoneFlex T710 supports a wide range of value-added applications such as guest networking, Dynamic PSK, hotspot authentication, wireless intrusion prevention and many more. WLANs can also be grouped and shared by specific APs. In a centrally managed configuration, the ZoneFlex T710 works with various authentication servers including AD, LDAP, and RADIUS. Ruckus Zoneflex T710 Zoneflex T710,802.11ac Wave 2 Outdoor Wireless Access Point, 4x4: 4 Stream, Mu-mimo, Omnidirectional Beamflex+ Coverage, 2.4ghz And 5ghz Concurrent Dual Band, Dual 10/100/1000 Ethernet Ports, 90-264 Vac, Poe In And Poe Out, - Ruckus Zoneflex T710 Zoneflex T710,802.11ac Wave 2 Outdoor Wireless Access Point, 4x4: 4 Stream, Mu-mimo, Omnidirectional Beamflex+ Coverage, 2.4ghz And 5ghz Concurrent Dual Band, Dual 10/100/1000 Ethernet Ports, 90-264 Vac, Poe In And Poe Out, Fiber Sfp, GPS, Ip-67 Outdoor Enclosure, -40 To 65c Operating Temperature. Includes Standard 1-year Warranty. Worldwide Version. Ruckus Zoneflex T710s Zoneflex T710s,802.11ac Wave 2 Outdoor Wireless Access Point, 4x4: 4 Stream, Mu-mimo, 120 Degree Sector Beamflex+ Coverage, 2.4ghz And 5ghz Concurrent Dual Band, Dual 10/100/1000 Ethernet Ports, 90-264 Vac, Poe In And Poe - Ruckus Zoneflex T710s Zoneflex T710s,802.11ac Wave 2 Outdoor Wireless Access Point, 4x4: 4 Stream, Mu-mimo, 120 Degree Sector Beamflex+ Coverage, 2.4ghz And 5ghz Concurrent Dual Band, Dual 10/100/1000 Ethernet Ports, 90-264 Vac, Poe In And Poe Out, Fiber Sfp, GPS, Ip-67 Outdoor Enclosure, -40 To 65c Operating Temperature. Includes Standard 1-year Warranty. US Version. Ruckus Zoneflex T710 Zoneflex T710,802.11ac Wave 2 Outdoor Wireless Access Point, 4x4: 4 Stream, Mu-mimo, Omnidirectional Beamflex+ Coverage, 2.4ghz And 5ghz Concurrent Dual Band, Dual 10/100/1000 Ethernet Ports, 90-264 Vac, Poe In And Poe Out, - Ruckus Zoneflex T710 Zoneflex T710,802.11ac Wave 2 Outdoor Wireless Access Point, 4x4: 4 Stream, Mu-mimo, Omnidirectional Beamflex+ Coverage, 2.4ghz And 5ghz Concurrent Dual Band, Dual 10/100/1000 Ethernet Ports, 90-264 Vac, Poe In And Poe Out, Fiber Sfp, GPS, Ip-67 Outdoor Enclosure, -40 To 65c Operating Temperature. Includes Standard 1-year Warranty. US Version.